April 16th Shelled our Trenches the shells dropped close but did little damage no casualties, relieved by 8th Battalion rotten night hardly see. April 22nd Trench Shelled just heard that where battle been to at Hill 60 been at it now for nearly a fortnight. 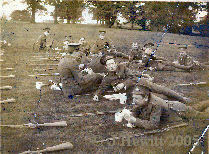 May 2nd Relieved by 8th coming back to billet where ordered to man reserve trenches so returned at 6am on May 3rd. The shells are nothing in comparison to the everlasting torture of lice and the loathsome mud. To see me trudging along one would take me for an old man of sixty. Stuart Chapman was one of the lucky ones. A young soldier suffering staunchly through the nightmare of trench life in World War One, he returned to his native shores after the Armistice in one piece, unlike so many of his generation, many of whom never reached majority age.